So this is the COTD-related project I was talking about... it's an ART SHOW! 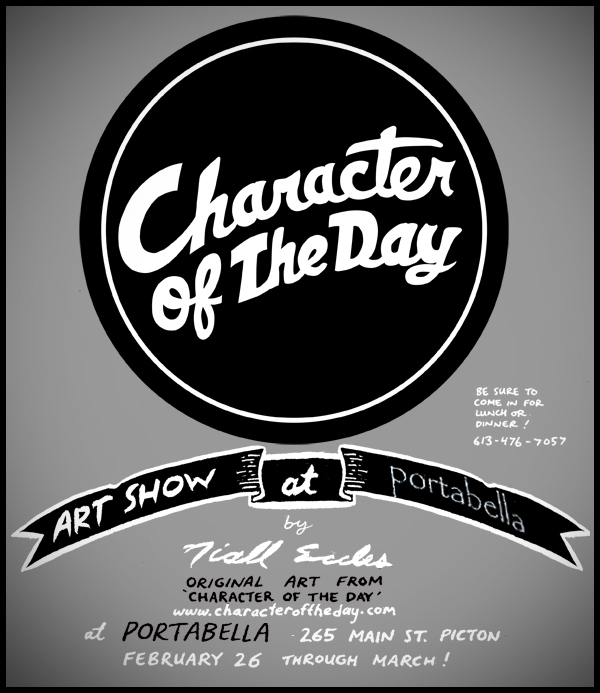 Starting on Wednesday, February 26, Portabella (265 Main St. Picton, Ontario) will be showcasing a variety of art from Character Of The Day. It's actually the very first time I've ever presented a show dedicated exclusively to Character Of The Day artwork, and I'm definitely thankful to Portabella for giving me the chance to present something like 38 framed cartoons (give or take a few), including content from the series' earliest days to more recent characters. Portabella is a fantastic place for lunch for or dinner, so if you're in town, please stop in for a meal and check out the COTD show!